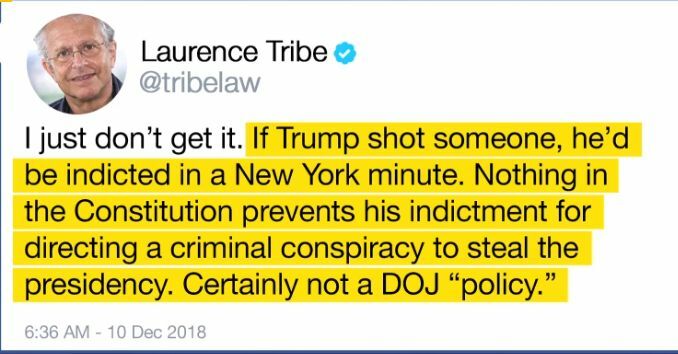 A sitting President CAN be indicted as he is just a citizen like everyone else (its in the Constitution). The GOP/Fox may be pushing a "Dear Leader" narrative where the President is above the law but the right are unAmerican and undemocratic in nature (their love affairs with dictators their leaders tell them to love, proves that). Only idiots and traitors like Brett Kavanaugh (from the Bush white House) don't believe a President should be held accountable (obviously) but he should be impeached anyways (for lying under oath). 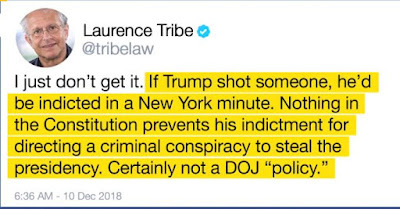 Laurence Tribe: Trump can be indicted for federal crimes Trump might think that he has immunity from prosecution, but Laurence Tribe explains there's nothing in the Constitution that prevents the indictment of a sitting president.